Join us at HPE Discover and learn how to modernize your infrastructure for transactions and analytics workloads. Check out our recommendations for top sessions and demos . In today’s economy where customers are gained or lost in a matter of seconds, mission-critical solutions are vital to business transformation. Join us at HPE Discover and learn how to modernize your infrastructure for transactions and analytics workloads including Oracle, SAP and SQL Server. Is your current infrastructure slow to respond, hard to manage and experiencing rising costs? Are you exploring fast, always on, cost-effective and future-ready solutions? Register today for the event and these sessions. See you in Las Vegas! At 20 light-minutes away, Mars is too far to rely on communication from Earth for real-time support. Astronauts will need to travel with and be guided by the most powerful computing system the world has ever seen. But the incremental increases we are seeing in computing power will not meet the demands of the challenge. We need a major computer upgrade, and Hewlett Packard Enterprise has the answer. Tune in next Tuesday, May 16, 2017, at 11:20 AM PT / 2:20 PM ET to watch Hewlett Packard Labs chief architect and lead for The Machine research project, Kirk Bresniker, deliver a Facebook Live presentation from Washington D.C. on Memory-Driven Computing and its potential to support the mission to Mars. Nothing excites the mind and sparks our curiosity as much as space. As missions like New Horizons push to the edge of our solar system, private companies have reignited the next generation space race. Lately, the Red Planet has grabbed our attention, sparking the question, what combination of players and technologies will have to come together to make the first human-led mission to Mars successful? The Atlantic will survey a shifting landscape of new technologies, exploring the cosmos by gathering experts on the growing space industry and the future of space and extraterrestrial travel. Where will the next space race take us, what are the challenges facing the mission and what do we need to know, build and create to get there? We are excited to announce the launch of the NonStop Under 40 website, www.NSU40.com. NSU40 started as a meeting at the 2016 NonStop Technical Boot Camp, where NonStop professionals with varying degrees of experience met to discuss the current state of NonStop as it relates to the next generation of talent. 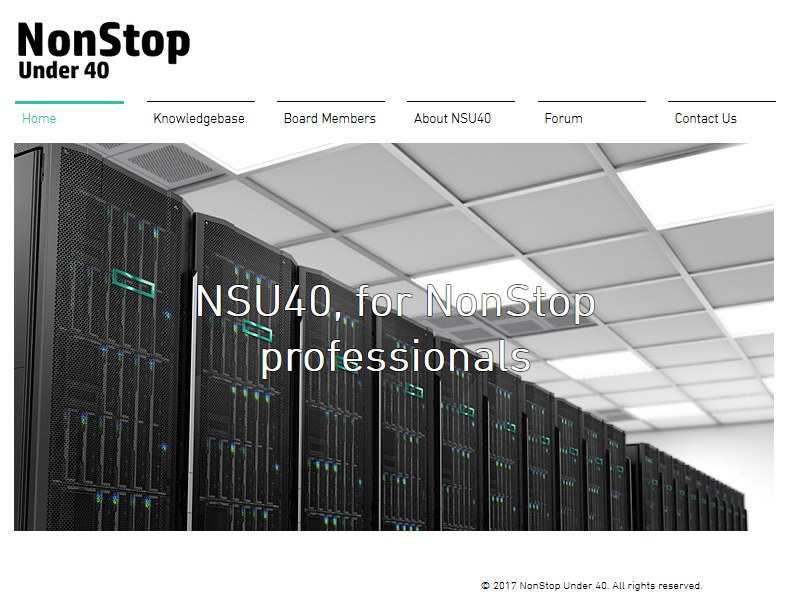 The NonStop Under 40 mission is to bring HPE NonStop Server awareness to a new generation of professionals by fostering professional development through relationship building, education and information sharing from the NonStop Community. The website includes a Knowledgebase where the group is currently working to make educational videos and host online classes, as well as a Forum for people to discuss all things NonStop. It is a work in progress so we definitely ask for your involvement and feedback, as well as your help to spread the word. Please register at https://www.nsu40.com/forum/ to start participating today! In the 18 months since the company split from its sister consumer business, Hewlett Packard Enterprise has been in an almost constant state of refining its strategy. The company backed out of the public cloud market; sold off its Enterprise Services Business to competitor CSC for $8.5 billion; dealt other “non-core” assets to Micro Focus in an $8.8 billion deal; and dumped its OpenStack and Cloud Foundry development efforts off to Suse. HPE also bought all-flash storage vendor Nimble storage for $1 billion last month and snapped up hyperconverged infrastructure vendor Simplivity for another $650 million in January. HPE’s overall strategy has been narrowed to focus on three core areas, Lewis says. One is hybrid IT: HPE wants to help customers build private clouds on next-generation infrastructure that integrates with public cloud resources. A second broad focus area is what Lewis calls the “Intelligent Edge,” which encompass technologies related to the Internet of Things. Finally, the third pillar revolves around services and helping customers successfully execute projects in the first two areas. One perception that HPE struggles with is the notion that it doesn’t have a public IaaS cloud to compete with the likes of Amazon Web Services, Microsoft Azure and Google Cloud Platform. Lewis says despite public IaaS cloud getting the lion’s share of attention, “that misses how important private cloud is.” Private cloud and on-premises infrastructure is the market that HPE wants to own, which includes helping customers manage their use of public IaaS cloud resources. This strategy will not be easy though as a host of other legacy enterprise infrastructure vendors are vying for the same prize, including Dell-EMC, Cisco and IBM. There is opportunity though. A recent Worldwide Infrastructure Forecast by IDC estimates that through 2020, public cloud infrastructure is set to grow at 15% compound annual growth rate; private cloud is forecast to grow at 11%. This compares to traditional IT growing at only 2%. If companies like HPE and others can offer compelling options, there is a market for enterprises to upgrade their on-premises infrastructure. On the immediate horizon for next-generation enterprise data center design is hyperconverged infrastructure. HCI or integrated systems typically deliver a package of pre-compiled servers, network and storage components in a single engineered offering. This is opposed to buying those components separately and end users configuring them. HCI systems are typically sold as software that controls infrastructure resources or as hardware-software combinations, and they’re most typically used for virtual desktop infrastructure or as a type of VM vending machine that offers users virtual or even bare metal infrastructure, says Gartner research director Paul Delory. HPE’s product in this market is named the Hyper Converged 380, and it has been out for a couple of years. Most analysts see it as trailing offerings from market leaders Nutanix, Simplivity and Dell EMC (VxRail). HPE significantly upgraded its position in the market when it acquired Simplivity, automatically making the company one of the premier HCI vendors. HCI is an estimated $1.5 billion annual revenue run rate market and is in a phase of “rapid maturation,” says Forrester Research analyst Richard Fichera. As the market matures, he expects use cases for HCI will become more diverse and more widely known about. A recent survey by Forrester found that up to 50% of HCI customers were running databases on their HCI platform, and up to one-third were running enterprise applications such as collaboration, enterprise resource planning or HR and finance apps on HCI. Lewis says the plan is to integrate the HC380 and Simplivity product lines, with the first step being to certify Simplivity to run on HPE’s DL380 servers this year. In the future, HPE will plan to offer Simplivity exclusively on HPE hardware, while still supporting any previous Simplivity customers who run the system on non-HPE hardware, Lewis says. HCI is a viable market today, but Lewis and HPE are already looking beyond that to the future. What Lewis is really excited about is HPE Synergy: It’s what he calls a composable infrastructure system that HPE launched in December 2015. Composable infrastructure has three components: Fluid pools of compute, storage and fabric (network) capacity that can be provisioned as needed; software-defined intelligence that controls them; and an API to access it. Synergy is sold in a 21-frame unit that supports 12 modules per frame. The idea is that Synergy is made up of compute, network and storage, and developers can request a virtual machine with any combined amount of those resources. When the workload is done running, those infrastructure resources are delivered back to the “pool” for other users to access. One workload could be a compute-heavy application with a lot of CPU power; another could be memory-heavy for read-write operations. This is a different idea than an HCI system, which typically provisions pre-configured VM or bare metal infrastructure templates. Composable is more similar to the idea of a public cloud where resource capacity is simply requested and provisioned from shared capacity. The difference with Synergy compared to public IaaS cloud is that it sits on customers’ premises. Like cloud, HPE offers Synergy in an “opex” buying model in which customers pay for the product based on how much they use it; or they can buy it outright as a capital expense. HPE is unique in the market offering composable infrastructure, Fichera says. Cisco had a composable product with the M Series of its UCS servers, but no longer actively sells those because of a lack of demand, the company said. Fichera says it’s unclear yet if Synergy will be more desirable. HPE does have paying customers willing to talk about their use of Synergy. The HudsonAlpha Institute for Biotechnology in Huntsville, Ala., houses hundreds of researchers studying the latest in genomic medicine. This science specialty creates petabyte-scale data and requires batch compute processing jobs. HudsonAlpha CIO Peyton McNully says the long-term goal is for his IT department to transition from HPE C-7000 servers to Synergy, and that’s a process that’s underway. “Ultimately, (Synergy gives us) more flexibility and better software definition through Rest APIs,” McNully says. “Some days we run a hypervisor for certain workloads, then in the evening hours it’s back to bare metal, CentOS and Docker containers for batch processing jobs.” Enabling that flexibility can be “quite expensive” on standard infrastructure equipment, he says, but by using Synergy HudsonAlpha is able to compose the exact-sized infrastructure environment each workload needs. List pricing for the HC380 ranges from $26,000 to $100,000 for an all-flash configuration. For HPE Synergy, list pricing starts at $12,750 per compute block for one- to 36-server configurations, with discounts when buying in volume. Connect Community Announcement - NonStop Under 40 website and Forum | Register for free! Are you a NonStop user or practitioner under the age of 40? If so, we have a new community for YOU! The NonStop Under 40 SIG has launched an official website with a NonStop Knowledge Base, Tech Forums, and boasts amazing potential for networking. Take a moment to check out (and register for) the NonStop Under 40 SIG today! FREE HP-UX Webinar on January 31 and February 2. Register NOW! Attend this webinar to hear how you can benefit from new innovations available now in our Integrity servers and HP-UX family of products. Learn how you can improve manageability, availability and efficiency of your mission-critical Integrity environment when upgrading to the latest version of HP-UX 11i v3 and Integrity servers. The key innovations include support for Veritas 6.1 file system, vPar online migration and OpenStack for HP-UX. Find out how other companies across the globe are gaining value by upgrading to the latest environment. This webinar will focus on the benefits and features recently released for HP-UX 11i v3. 31st January, 2017, 7:30 a.m. PST. 2nd February, 2017, 8:30 a.m. IST. Welcome to Atmosphere: Save up to $300! Legendary Innovator Guy Kawasaki Joins as Keynote Speaker We are offering up to $300 off registration for individuals who haven't attended an Atmosphere event in the past. Come experience the largest mobility conference on earth and see what makes this event a hit year after year! We are thrilled to have Guy Kawasaki, the world renowned author, innovation evangelist and entrepreneur as our featured keynote at Atmosphere 2017. He will be sharing his unique experience and latest insights on taking innovation to the edge! And don't forget to check out the Atmosphere sessions to start planning your time with us in Nashville. Take advantage of your special promo now! Expires on Jan 27, midnight PST. More About Guy Guy Kawasaki is the chief evangelist of Canva, an online graphic design tool. He is a brand ambassador for Mercedes Benz USA, and an executive fellow of the Haas School of Business. Check out Guy's TED Talk on The Art of Innovation. The Gen-Z Consortium is a new open industry group devoted to creating an open interconnect standard. Hewlett Packard Enterprise is pleased to announce that we have joined this group. Gen-Z is a computer interconnect standard that uses memory semantics and modern PHY designs to offer high-performance, low-latency connectivity to large amounts of next generation memory devices at chassis and rack scale. Its characteristics also make it an excellent choice for node-node connectivity, pools of accelerators, and efficient bridging to existing datacenter fabrics like Ethernet or Infiniband. It is being administered by the Gen-Z Consortium, an industry group that currently includes AMD, ARM, Broadcom, Cavium, Cray, Dell EMC, Hewlett Packard Enterprise, Huawei, IBM, IDT, Lenovo, Mellanox, Micron, Microsemi, Red Hat, Samsung, Seagate, SkHynix, Western Digital, and Xilinx, with others expected to join soon. VMS Software, Inc. (VSI) today announced plans to replace the existing OpenVMS TCP/IP stack with a completely updated stack based on software licensed from Process Software, LLC a long-time OpenVMS independent software vendor based in Framingham, Massachusetts. The license allows VSI to integrate features of Process Software's MultiNet software with VSI’s releases of the OpenVMS operating system, and add VSI’s own modifications and improvements over time. Details about specific TCP/IP components will be made available on the VSI website shortly (http://www.vmssoftware.com), including a comparison table displaying the two stacks side by side. Some of the major updates include: OpenSSL 1.0.2, SSH (V1 & V2), DHCP v3, IPv6 (complete application protocols supported), IPSEC (full support), Bind 9.9, Kerberos 5, and advanced features such as IPS, paired network interface support, and improved performance monitoring capabilities. VSI intends to release the new TCP/IP stack as VSI TCP/IP V10.5. The timing of the release is still being determined, but we intend to accelerate time-to-market, by first distributing V10.5 as an independent installation kit. Customers will have the option to keep using the existing stack or install V10.5. However, the older stack will be phased out within the next 2 years. Process Software is a premier supplier of communications software solutions to mission critical environments. With a loyal customer base of over 3,000 organizations, including Global 2000 and Fortune 1000 companies, Process Software has earned a strong reputation for meeting the stringent reliability and performance requirements of enterprise networks. Process Software products include MultiNet, a full suite of TCP/IP applications and services for OpenVMS VAX, Alpha and Integrity platforms. Hewlett Packard Enterprise, Intel and IDC invite you to join them on October 19th - 20th, 2016 in Barcelona Spain. Organized so you can make the most of your time in Barcelona, we coincided TMCE2 with VMWorld. Join us at the W Hotel Barcelona for the opportunity to review and discuss market trends and find out how we can help you transform your mission critical environment. Find out more and register here. FREE WEBINAR - How Can the Concept of Secure Content Management Help You Align Information Governance and Security? Join us for a FREE webinar on September 29th! Space is Limited! Reserve your Webinar seat now. Join this interactive webinar to see how you can leverage the concept of secure content management to support privacy and information security transparently within your information governance program. You will also learn how the need for security, business continuity, and data protection can be balanced with collaboration and productivity expectations to successfully deliver the desired business outcomes for your stakeholders and customers. There will be an opportunity throughout the session to share your thoughts, experiences and answer any questions. After registering for the webinar, you will receive a confirmation email containing instructions and information on joining the webinar. Wiesbaden, Germany – 1 July 2016 – comForte 21 GmbH announced today the appointment of Michael J. Deissner as their new CEO. He will assume responsibilities on 1 July 2016 and will succeed Dr Michael Rossbach, who will retire from this position on 30 September 2016. Michael Deissner is joining comForte from Cytonet, a biotech company, where he was Managing Director for the last 15 years. Michael started his career as a Managing Director of a medium-sized services company, before joining SAP AG in 1997 working as the Executive Assistant to the Board of Directors at SAP AG. During this period, he held different positions with varying responsibilities for SAP’s internal and external projects. A leading global provider of connectivity, security, and application modernization solutions, comForte delivers best-in-class products and support for customers using the HPE NonStop platform. Building upon many years of experience, comForte has helped customers make the most of their investment in NonStop systems and applications with a wide range of innovative and proven products for secure NonStop system connectivity, data and system security, application modernization, and integration. With offices in Germany, the United States, Singapore, and Australia, comForte has global reach with local staff and has served as a trusted HPE NonStop partner since 1998.
comForte’s roots in the HPE NonStop (Tandem Computers) market go back to 1979, and today, comForte’s leading security products are protecting data at rest, data in transit, and are included in HPE’s NonStop OS (operating system). comForte, Inc. (Denver, USA), comForte Pty. Ltd (Sydney, Australia), and comForte Asia Pte. Ltd. (Singapore) are wholly owned subsidiaries of comForte 21 GmbH. For more information about comForte please visit www.comforte.com. They don’t call it HP Enterprise for nothing. Some of the new technology hitting the screen in Star Trek Beyond is coming from Hewlett Packard Enterprise, and they couldn’t be more excited about it. Should I admit that the hype reminds me of a certain propulsion expert named Kosinski, who needed a buddy from Tau Alpha C to make the magic happen? And I still love this beauty from 1998, despite the dizzyingly frequent cuts. Today’s business environment is evolving into a digital ecosystem, and that ecosystem must support a very digital user. What’s fascinating is the pace and acceleration of this evolution. Mobility, the Internet of Things and the growth of cloud are all impacting services--and entire go-to-market strategies. Through it all, companies need their technology to keep up with evolving consumer and business demands. It’s for these reasons that the days of the massive data center build-outs are quickly coming to an end. Organizations need a new way to unify key resources to deliver more applications, desktops, data and user content. Furthermore, organizations need their data centers to run more efficiently, operate with a reduced overall footprint and support emerging digital business initiatives. All of this brings us to next-generation converged architecture. In the past, convergence was fairly basic, with minimal management or virtualization involved. It was basically a collection of hardware resources, rather than complex individual components making up a better whole. Today’s converged infrastructure (CI) solutions are smarter, smaller and much more efficient than anything we have seen in the past. They also have direct integration with virtualization and cloud solutions. Indeed, there are big benefits to CI, and we are seeing an adoption boom. According to the IDC Worldwide Quarterly Converged Systems Tracker, the worldwide converged systems market increased revenue 8.5% year over year, to $3.1 billion during the fourth quarter of 2015. The market generated 1,547 petabytes of new storage capacity shipments during the quarter, up 26.9% compared to the same period a year ago. For the full year of 2015, worldwide converged systems market revenue increased 8.3%, to $10.6 billion, when compared to 2014. "We are seeing some of the market demand move into deals with lower average selling prices, which is driving a shift from traditional converged systems to hyperconverged systems," said Kevin M. Permenter, senior research analyst, Enterprise Servers. "Right now, most of the growth is coming from the mid-market, which is heavily skewed toward hyperconverged systems. We are expecting to see this trend continue into the near term." CI helps create the bridge into digitization. With so many new connections coming into the data center, there must be architecture in place that can support it all--and scale. CI allows for greater levels of multi-tenancy while still reducing overall data center real estate requirements. In addition, these solutions integrate with virtualization systems to support powerful application and desktop delivery strategies. Moving forward, CI will enable greater levels of digitization by supporting more interconnected devices in the data center. CI better supports quickly changing business strategies. The ability to scale and grow quickly is a big part of supporting evolving organizational goals. Converged systems scale as building blocks of the business. This means that onboarding of new users, divisions or even entire businesses can be done quickly and efficiently. Furthermore, integration with virtualization solutions and management helps create an architecture that scales both physical and virtual components. Finally, these systems will help scale on-premise resources and integrate with specific cloud services. New cost economics are achieved with CI. Remember, you’re not only impacting the data center here; you’re also helping create better business economics. IT is quickly becoming a more service-driven organization as the data center becomes more turnkey. Businesses are now seeing IT as a consumption model that directly integrates with the organization’s strategies. Not only does CI help create better data center economics, it fundamentally helps the business run more efficiently. When IT acts as a direct business enabler, you experience better user productivity, improved technology cost structures and a greater ability to execute on business strategies. Moving forward, solutions around CI will be the building blocks of the next-generation business. The ability to quickly pivot based on market trends is critical to maintaining a competitive advantage. Organizations will need to clearly identify their business and IT strategies to see how the data center can support these goals. In working with CI, you create the level of flexibility and scalability needed to grow in a digital world. If you haven’t played the new “Pokemon Go” game yourself, someone close to you definitely has. The game has gone viral since its release, and it has people out in droves wandering around neighborhoods looking for Pikachu. In the workplace, cloud apps such as “Pokemon Go” are wildly popular — and have been for a while. We all want to play, but CISOs must consider some general security requirements to be both efficient and safe. Here are five requirements from “Pokemon Go” that can be applied to adopting cloud apps in your organization. There are lots of Pokemon out there, but which ones are best for your needs? Having a good view of all the apps in use within your organization will not only help understand what needs your employees are looking to address, but also provide insight into where you might need to take corrective actions. For every Blastoise, there are ten Magikarp. Pick the apps that address the right balance of functionality and corporate security requirements. Games are no fun if you have to enter a long, complex password every time you want to play. The same goes for cloud apps. You need to ditch the passwords in favor of a federated system that enables strong authentication but does not require employees to enter long passwords or write complicated ones down on sticky notes. One of the great things about “Pokemon Go” is that it gets kids (and parents too) out of the house and active. This is great, but some rules have to be followed. You wouldn’t want your kids wandering around in strange neighborhoods or out all night. This also applies to cloud app usage. Policies have to be in place to ensure apps are used within corporate guidelines, ensuring safety for both the employee and the organization. Cloud apps such as “Pokemon Go” are designed to be used on mobile devices. When deploying cloud apps to the enterprise, you have to consider mobile devices as a primary platform. It requires the same security safeguards and user experience that your employees on laptops behind the firewall have. Educating your employees raises their combat power (CP) to defend against threats. The more employees know about appropriate app usage and the potential threats, the lower the chances of their being taken down by Charizard — or an easily defeated cyberthreat. Remember, just like with “Pokemon Go,” the key to success is to stay active and vigilant. Taking an active security role makes cloud applications safer for everyone. SINGAPORE: For Asian Star Trek fans, Jul 21 is the date they have been waiting for. It is, after all, when the latest installment in the long-running movie franchise - Star Trek Beyond - will be premiered in many regional markets. Helmed by Fast and Furious director Justin Lin, the movie features stars such as Chris Pine, Zoe Saldana, John Cho and Zachary Quinto, as well as the final appearance of Anton Yelchin, who died last month in a car accident. But besides the stars and action sequences - a trademark of Lin's - the technology featured in the movie also takes a look into what computing could possibly achieve in the future. In particular, Hewlett Packard Enterprise (HPE) collaborated with Paramount Pictures to showcase The Machine - an ambitious research project to imagine how technology will look like more than 200 years into the future. Essentially, photonics is the use of light for communications instead of traditional copper wires. Mr Kirk Bresniker, HP Labs Chief Architect at HPE, told Channel NewsAsia in an email interview that to transmit information over copper wires currently is cheap but inefficient. "Launch 100 electrons down a network cable and only a couple of per cent of the energy you spend makes it to the other end; the rest are lost as heat and radio interference," Mr Bresniker explained. "Photons are great because they can travel very far without loss." As such, HPE, via The Machine, is looking at using miniscule lasers on microchips to convert electrical signals to light, and back again, to achieve energy efficiency and lower latency - the time taken for a packet of information to be sent to its destination and back on a network. Imagine the ability for your T-shirt or clothing in general to be able to process data - and send outlier results to, say, healthcare providers in the event of a medical emergency. This, said Mr Bresniker, could become a possibility with The Machine, as it has low power consumption levels and huge data storage capability. The sensors embedded in these processors could share vital signals to doctors in real time. "We already have glimpses of that with current fitness trackers. However fitness trackers need to communicate via Bluetooth and mobile phones. Again, using the mesh computing approach, communication could be guaranteed nearly everywhere, and lives could be saved," the HP Labs Chief Architect explained. This was one of three conceptual technologies developed for the film that is underpinned by the technologies mentioned above. The Diagnostic Wrap is a futuristic take on how enterprise hardware and software can be integrated, and it was designed to tap on the vast amounts of data being generated constantly as well as the information being fed back via machines, also known as the Internet of Things (IoT), according to HPE. What does that mean in practical terms? A dashboard to assess the health of one's space-travelling craft and everyone on it? Hewlett Packard Enterprise plans to refresh its Itanium server range around the middle of next year, employing Intel's long-promised "Kittson" successor to the current Itanium 9500 series ("Poulson") chips. News of the server update plans comes from Ken Surplice, category manager for mission-critical solutions at HPE's EMEA server division. Surplice told Dutch website Computable that the company is on schedule to refresh its Integrity servers for HP-UX and OpenVMS with Intel's upcoming Kittson Itanium processors in 2017, and that the servers should be with customers mid-year. HPE representatives contacted Thursday confirmed the 2017 target. The question, though, is why HPE would bother, given that it is working on putting its HP-UX flavor of Unix on x86, and that OpenVMS, another big reason for owning Itanium hardware, will be ported to x86 by 2018. One good reason for upgrading to Kittson is cost control, Surplice told IDG News Service via email. "Every customer is looking to manage and control their costs. Enhanced server performance means fewer cores are required, meaning fewer licenses are required," he wrote. One major software company that charges per core for its software licenses is Oracle. The company has been locked in a legal battle with HPE over its 2011 decision to break an agreement to port its software to Itanium. Last month, a court ordered Oracle to pay HPE US$3 billion in damages. Oracle is appealing. HPE will continue to develop and maintain its Itanium products because "another generation of servers will provide customers the continuity that we have promised in our roadmaps," he said. "Many customers continue to get great use from their HP-UX and OpenVMS applications running on Integrity servers powered by Itanium." The company has previously committed to building versions of its Integrity and Superdome servers with the Kittson chips when they become available. Intel's development of the Itanium platform has slowed to a crawl, though, with HPE the last significant customer still buying the processors. The chip company has been working on the Kittson update since at least 2011. The following year it said the chips would be socket-compatible with its Xeon processors and built with an advanced manufacturing process, providing a clear upgrade path for errant Itanium users to return to the x86 fold. Just three months later, though, it signaled that Kittson will probably be the last in the Itanium line, saying it will be built with the now-aging 32nm production process, and will remain pin-compatible with previous Itanium generations. That at least leaves open the possibility that Itanium users will be able to follow Surplice's suggestion and reduce their software licensing costs with minimal hardware changes. HPE has Itanium servers on its roadmap until 2025, and has promised to support its flavor of Unix, HP-UX, through that date. That would be an eternity in any other part of the IT industry, but Itanium is popular for running legacy workloads in the banking industry, where legacies can last a long time. OpenVMS, the other significant OS running on Itanium, is itself something of a legacy. Developed by DEC as VMS for use on its Vax minicomputers in 1977, it acquired the name OpenVMS when DEC ported it to its Alpha workstation chips. After Compaq bought DEC it began porting OpenVMS to Itanium, just in time to be swallowed by Hewlett-Packard. HP later spat out OpenVMS, handing responsibility for its future development to VMS Software. VMS Software has laid out a roadmap for future development of OpenVMS, now in version 8.4.2. The company is working on a port of the next major version, OpenVMS 9, to Intel's 64-bit x86 architecture, and expects to have that ready in 2018. HPE, meanwhile, is looking for ways for HP-UX to coexist with x86 systems. The company is looking at how HP-UX can be provisioned by OpenStack and HPE Helion, representatives said Thursday. Another technique it is discussing with HP-UX customers is putting their workloads in Linux containers. The company is not ready to sell such solutions, although it will show them if you ask: "Today we do not have customer materials ready to distribute on these topics. We have been busy working on the engineering and are now ready to expose this to interested customers," Surplice said Thursday. Dr. Heinz-Hermann Adam is a long-time HPE data storage customer. I met him for the first time six or seven years ago at an HP Tech Forum (predecessor to Discover) and was introduced to him because of his involvement with Connect, the independent HPE users group. This year at Discover, "H2" had a session talking about his experience using HPE 3PAR StoreServ and that was immediately followed by a session I cohosted in the Connect booth. Unfortunately, I had a conflict with a briefing I hosted with our bloggers - the executive Q&A that I posted recently. I tried to catch up with H2 at DIscover to record a podcast but I wasn't able to do it with him until after we left Las Vegas. H2 is the Technical Director for the Natural Sciences Department at the University of Münster. In the podcast, we discussed some of the features that are very important to the university and H2 also talked a lot about their use of the 3PAR StoreServ Controller (based on StoreEasy) for unstructured data, which they have been doing for a long time - before we had the 3PAR File Persona. After about 11 minutes of talking about their IT environment, H2 and I spent the last few minutes of the podcast talking about Connect. I strongly support Connect and am the HPE liason for the storage special interest group (SIG). I also have a regular column in the quarterly Connect Converge magazine. I also host the storage SIG on a HPE Storage LinkedIn Group I manage - so if you're a customer or HPE Storage partner, request to join the group. To subscribe to the podcast, open this link and click on the "View in iTunes" button under my picture. If you don't use iTunes, you can find my podcast on TalkShoe.com. You can download this podcast by right clicking here and saving the file. 'm Calvin Zito, a 33 year veteran in the IT industry and have worked in storage for 25 years. I recently was named a VMware vExpert for the sixth consecutive year. As an early adopter of social media and active in communities, I've blogged for 8 years. I started my "social persona" as HPStorageGuy but with the HP separation, you can find me on Twitter as @CalvinZito. You can also contact me via email. Hewlett Packard Enterprise has many years of experience in migrating mission-critical applications from IBM Power Systems running IBM’s UNIX operating system AIX to HPE (previously HP) open-standards platforms. As HPE has demonstrated, most of these migrations create significantly less expensive operating environments, often cutting costs by more than 50%. At the same time, the HPE open-standards environments meet or exceed the performance and availability attributes of the original Power Systems.